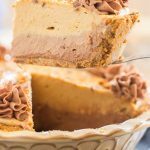 With a Biscoff crust and a no-bake cookie butter cheesecake filling, this pie is ready in about 30 minutes! 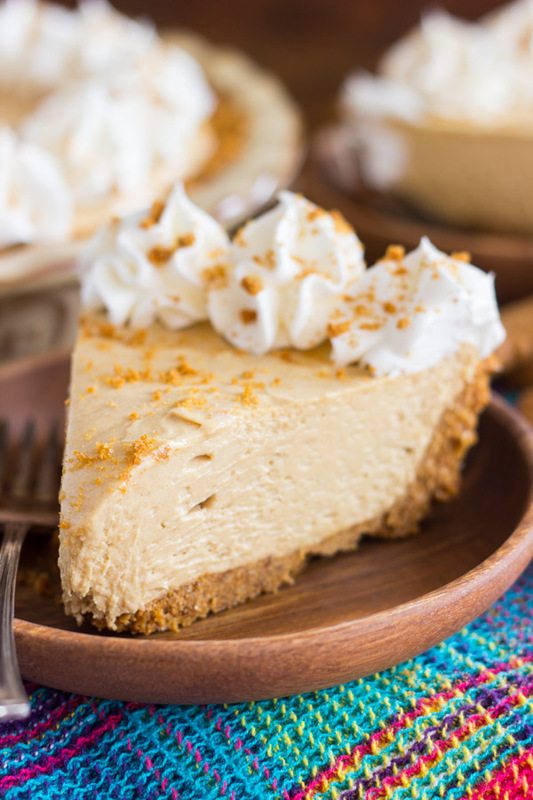 This Cookie Butter Cheesecake with Biscoff Crust features a creamy and fluffy filling, is strong on cookie butter flavor, and has a crunchy, cinnamon cookie crust! I was definitely supposed to be writing this post for you a little earlier this week, and I was definitely too caught up in Christmas activities for the last 48 hours, followed by a 1.5-hour stretch of shopping on the black hole that is Etsy. Toooo many fun things on there. I finally had a moment to write to you, and instead I was looking at mid-century modern cocktail pitchers and soup bowls. Oops. I am visiting my family up north, and I got in Monday night. It’s been non-stop Christmas festivities since I landed. Christmas shopping, driving around looking at Christmas lights, getting my Gma’s tree decorated, as well as my Mom’s tree. Somewhere in there we watched pieces of “Elf.” It’s been such a whirlwind that I forget what else. 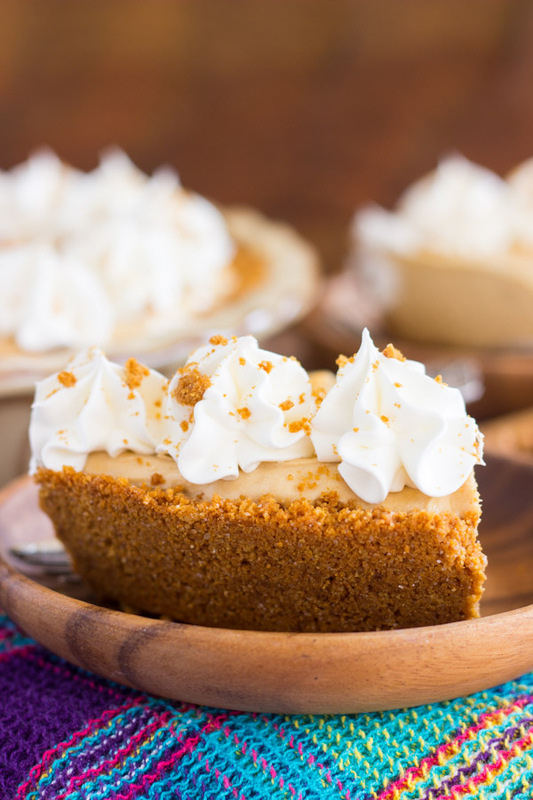 But this Cookie Butter Cheesecake recipe is important, dangit! Let’s do this. My Gma’s oven is broken. It was supposed to be fixed by Christmas, but it’s not. It’s a little problematic, yes, but we’re working around it! Quite honestly, I did so much baking leading up to Christmas, that I’m okay with having a little pressure removed to bake for Christmas Day. 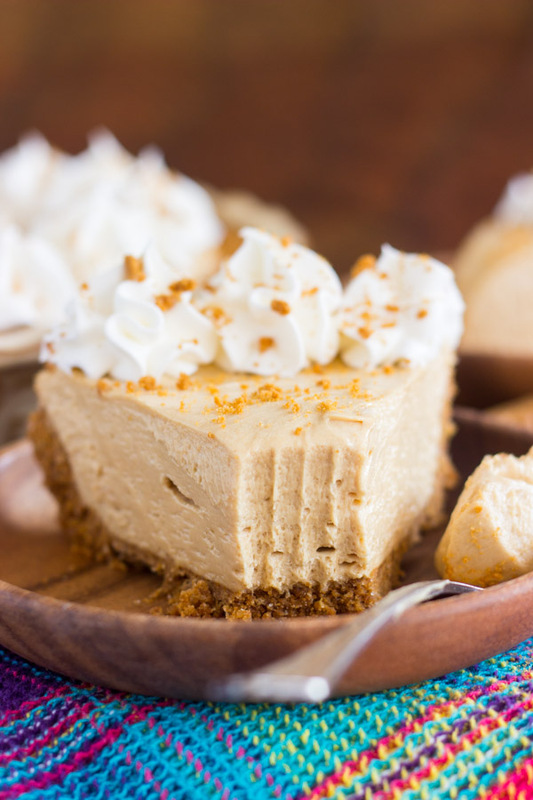 If for some reason you also don’t have an oven, here is what you make: Cookie Butter Cheesecake with Biscoff Crust! Here’s what else though: Gingersnap Chocolate Ganache Truffles, Salted Peanut Butterscotch & Caramel Corn Bark, and No Bake Eggnog Cheesecake with Gingersnap Crust (provided my Gma hasn’t guzzled it all by the time we get to making this!). 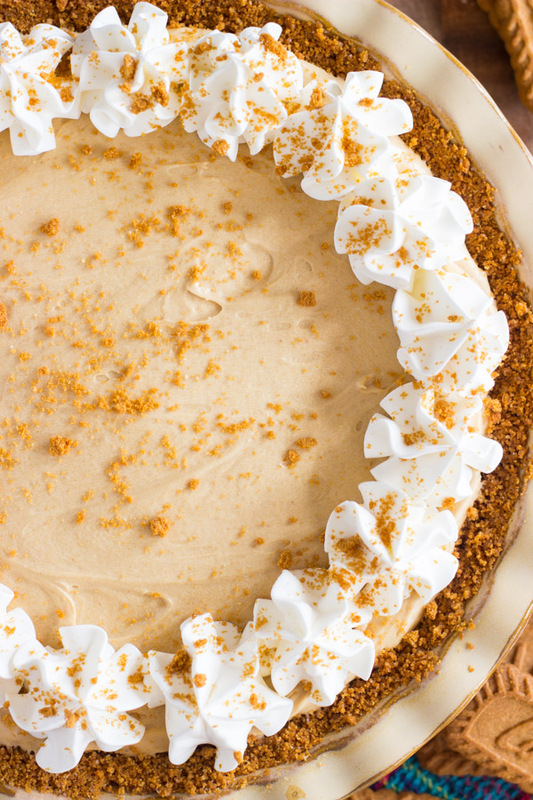 Oh, and probably this No Bake Peanut Butter Pie recipe. We make that for every holiday, whether we have a working oven or not. 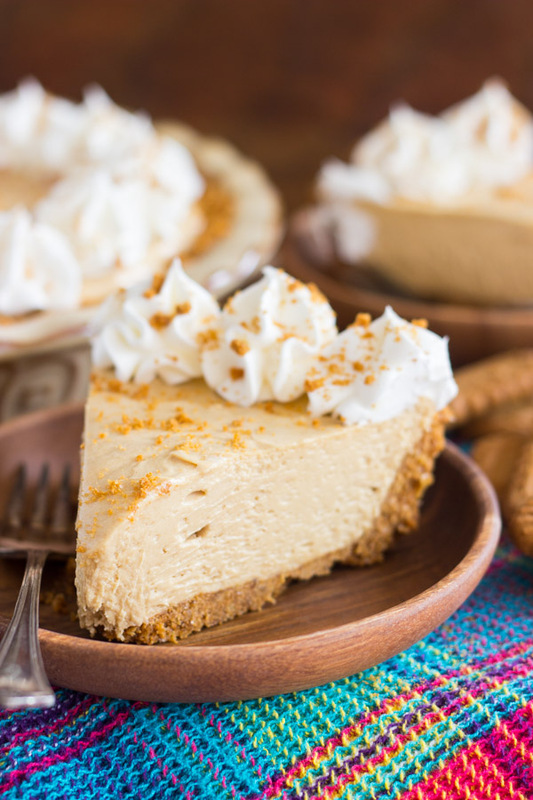 Should you find yourself in a similar situation, without a functioning oven, or you simply don’t want to bake, or you are looking for a last minute dessert, I can’t say enough good things about this Cookie Butter Cheesecake with Biscoff Crust. I think the Biscoff crust benefits from 10 minutes in the oven to solidify, but you don’t have to bake it. 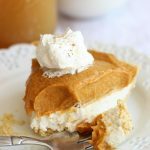 I basically took our family’s favorite No Bake Peanut Butter Pie recipe and swapped out peanut butter for cookie butter. And then I swapped out a graham cracker or shortbread crust for crushed Biscoff cookies! Oh my gawwwwd, Biscoff Crust is sooo good. 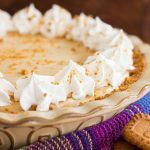 The Cookie Butter Cheesecake filling is so creamy and fluffy, but rich, and strong with cookie butter flavor. 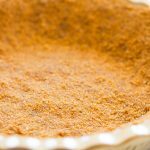 The Biscoff cookie crumb crust is sweet, cinnamony, and buttery. It’s crunchy and perfect, and lovely in contrast with the creamy, rich filling. It’s the easiest dessert, and it is a crowd-pleaser, guaranteed. 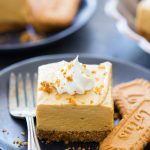 For something simple and last minute, you cannot go wrong with this Cookie Butter Cheesecake with Biscoff Crust! My infatuation with Cookie Butter started with a snickerdoodle-themed dessert though, so I felt I needed to go back to those roots. It was these Snickerdoodle Thumbprints with Cookie Butter Buttercream. Soft, buttery thumbprints, dusted with cinnamon-sugar, and filled with Cookie Butter Frosting. Then there’s these Oatmeal Sandwich Cookies with Cookie Butter Frosting, and these Soft Molasses Ginger Cookie Sandwiches with Cookie Butter Buttercream. 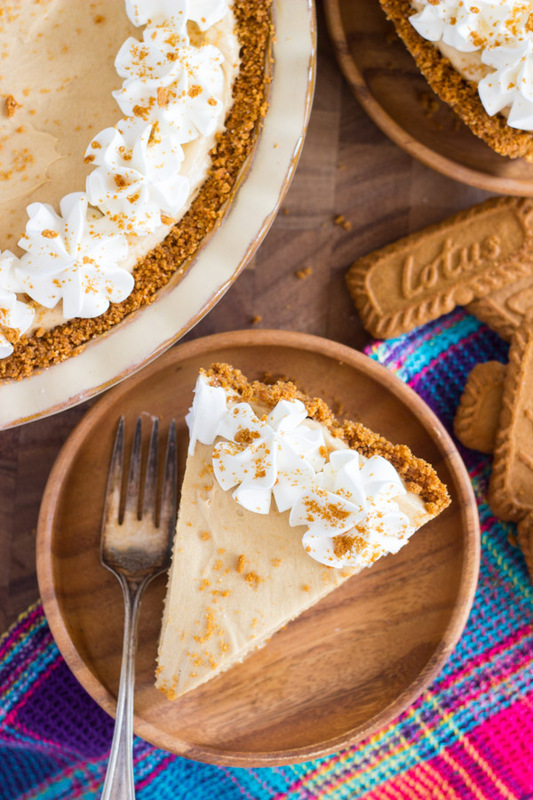 With a Biscoff cookie crust and a no-bake cookie butter cheesecake filling, this pie is ready in about 30 minutes! In a medium bowl, combine cookie crumbs, sugar, and butter. Press into the bottom and up the edges of a 9-inch pie plate. Bake at 350 degrees for 12-14 minutes, or until it's firm and set. In a large mixing bowl, beat cream cheese, cookie butter, powdered sugar, and whipped topping. Refrigerate until chilled, at least 30 minutes. P.S. Four more cocktails coming your way this week. Did you see the Grand Marnier & Kahlua Hot Chocolate Lattes?? 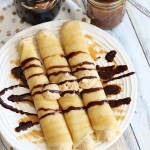 Follow along on Pinterest to easily view my other blog recipes! Your pies look delicious! 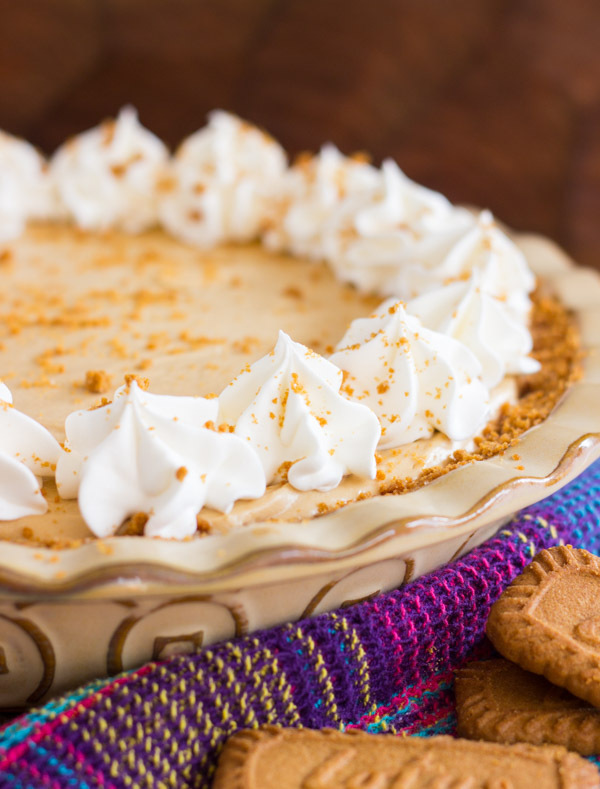 I just made a Biscoff Pie (similar recipe) two days ago–my family loves it! Are you familiar with Biscoff or Speculoos? Explain cookie butter…and yes I know Biscoff. You write in your recipe to use one cup cookie butter but nowhere in your lengthy preamble or anywhere in your recipe do you describe what cookie butter is.